The ‘Potomac Inkview’ uses Schmidt’s German made gold plated stainless steel nib assembly, and comes in fine, medium, and broad points. Except for some stainless-steel nuts and washers and some “O” rings, the balance of the 29 parts that make up the pen are all made in house by the maker. To keep the cost down, 24kt. gold plated brass is used instead of precious metals. Using his goldsmithing past, all exposed metal parts that are not threaded, have a “diamond stipple” finish, a labor intensive operation done before polishing and electroplating. The filling system uses a plunger filling system from bottled ink, which has a stainless steel shaft with a hand cut neoprene washer, and a 24kt gold plated brass compression valve (half of the valve is exposed when filling the pen). This system fills the ink reservoir with an average of 1.3ml of ink in a single stroke. 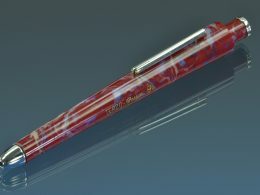 This can be seen in the 10mm viewing window in the body of the pen. All of this is encased in FLEXIGRAN, Richard L. Greenwald, LLC’s name for its polyurethane plastic that it uses for its pen bodies. FLEXIGRAN has been used by pen manufacturers and artisan pen makers for years and is known for its selection and depth of colors. The colors are formulated in house from dry pigments, and the sheets of plastics are made one at a time and takes a week to fully cure after heat treatment. Currently, there are 36 stock colors of FLEXIGRAN, any of which, can be made into the pen. If the color you want is not in stock, email us @ info@richardlgreenwald.com and we will custom make the pen for you at no additional charge. 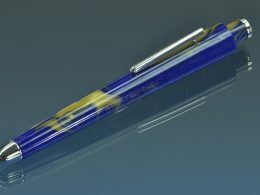 There is a 4 to 6 week delivery on custom Potomac Inkview Fountain Pens. The pen’s overall length is 161 millimeters and its maximum diameter is 18 millimeters, with a weight of 36 grams when empty. It is 151 millimeters in length without it’s cap (not posted); it is a large pen uncapped, so it fits comfortably in the hand, without posting, due to its shape.Since each pen is handmade, these values can vary.